1/2 oz of ginger juice (from the can) I find those cans at the Chinese grocery, it’s pink ginger in a glass container. 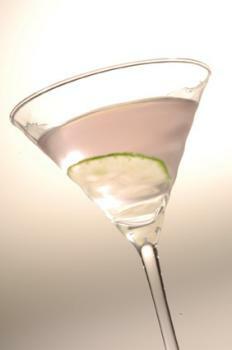 Method: Shake 1 oz Greygoose Vodka, 1/4 oz Noilly Prat and 1/2 oz of ginger juice with ice. Strain into a chilled cocktail glass. Garnish: A slice of cucumber. 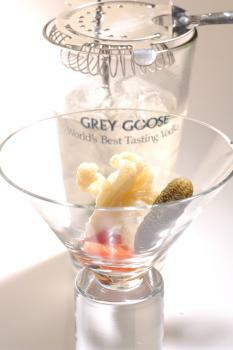 Method: Shake 1 oz Greygoose Vodka and 1/4 oz Noilly Prat with ice. Strain into a chilled cocktail glass. 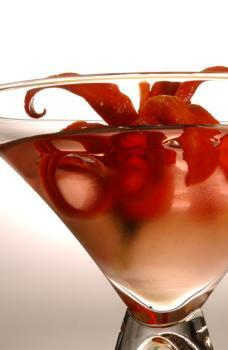 Garnish: A fresh red pepper – you can slice the pepper in advance and dip it for 2 hours in cold water to open it. Depending of your pepper this martini can be quite spicy. Method: Shake 1 oz Greygoose Vodka, 1/4 oz Noilly Prat and 1/4 oz juice of sweet & sour canned veggies with ice. Strain into a chilled cocktail glass. Garnish: 4 small sweet & sour (pickled) veggies.